This is not so much a recipe as a method: once you learn to apply it, you can use it for any cut of chicken or even fish. It’s flexible because it’s so simple: you can make a no-fuss lunch for a single person, or dinner for the family using the same technique. The reward for your efforts is all out of proportion to the work you have to put in: gently-cooked, tender meat with a fresh, pleasant flavor that complements almost any cuisine. It would pair equally well with a Mediterranean dish of fresh sliced tomatoes with olive oil, a more Middle Eastern choice like falafel, or just a simple side of roasted vegetables. If you want to really bring out the lemon, just add a few lemon wedges to the baking dish. 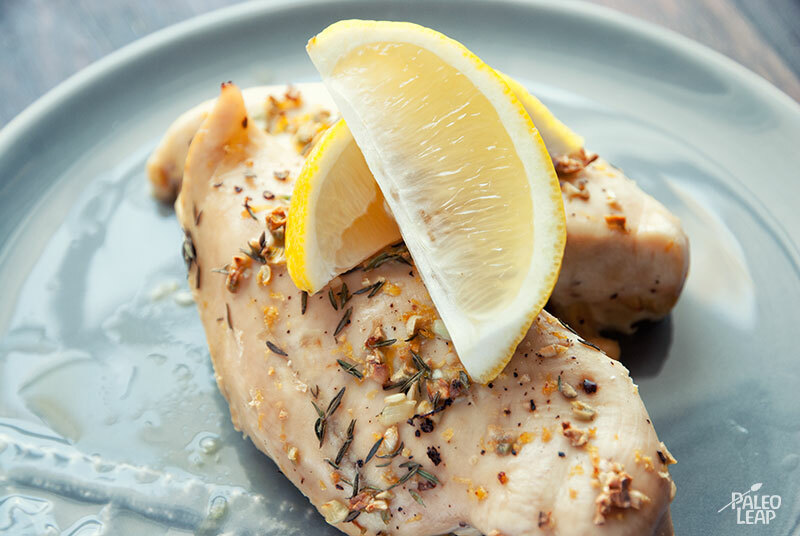 Chicken cooked this way is also perfect for chopping and tossing on a salad, since the lemon and herbs complement most salad dressings or vinaigrettes. The best accompaniment for this recipe is something with fat: baked chicken breast just doesn’t have enough fat to make a filling meal, so if you don’t add some, you’ll be hungry again an hour later. Avocado with a splash of balsamic vinegar would be a good choice (an avocado salad, perhaps? ), or try vegetables roasted in a generous amount of olive oil. Pesto is another option; olive oil and lemon just naturally seem to go together, and a few spoons of pesto actually make quite a good salad topping. There are all kinds of other ways to add fat to a meal, and none is better than the others – just make sure you pick one of them, so you can get the full benefit of all the nutrients from such a delicious and easy recipe. SERVES: 4 PREP: 10 min. COOK: 40 min. Season the chicken breasts on each side with sea salt and black pepper. 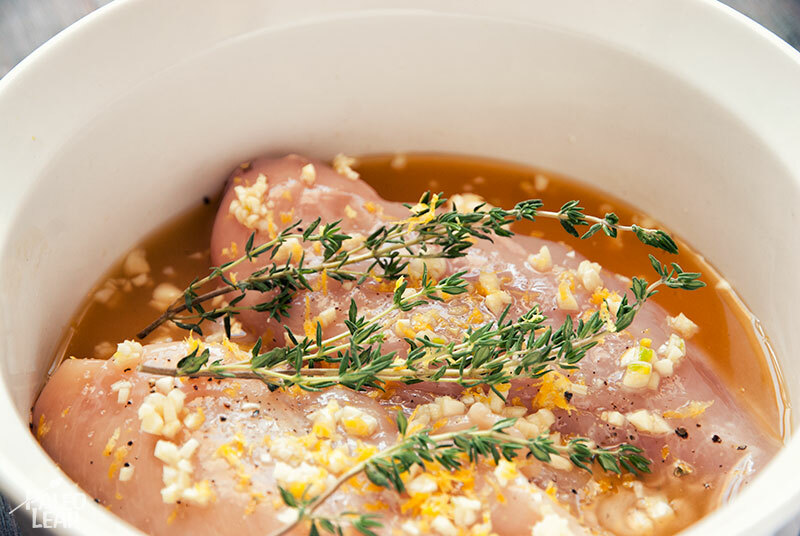 Place the chicken breasts in a baking dish and add the minced garlic, chicken stock, lemon zest, lemon juice, and thyme sprigs. Place in the oven and cook for 30 to 40 minutes, until the chicken is cooked through, basting one or twice during the process.